Always More to Hear: The t-shirt quilt, three years in the making. A trip down memory lane. The t-shirt quilt, three years in the making. A trip down memory lane. It's finally done! Three years ago, the lovely Serena Bartlett of GrassRoutes inspired me to finally DO something with all these t-shirts I had been collecting since I was little and couldn't part with. So over many sunny days in her living room she taught me to use a sewing machine. 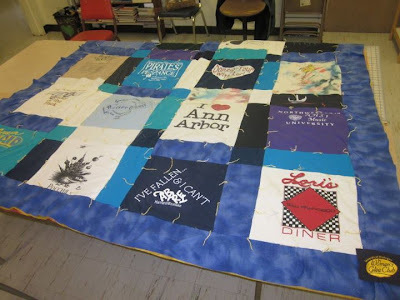 The quilt has no less than 19 shirts sewn into it, many of them building blocks of my musical life. I think I have a whole other stash of shirts from which I could make another one! Thank you so much to Serena and Elaine Turcotte for teaching me how to quilt and helping me through this process. This will not be my last, I'm sure of it. I'm so excited about sleeping with this gorgeous thing. So is the cat! She already loves snuggling with it. 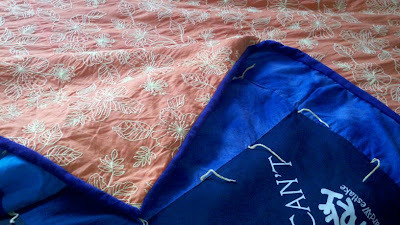 The flip side of the quilt is this gorgeous orange and yellow embroidered fabric, totally changing the colors in my bedroom, which I'm excited about. One of the best things is that I can now display the flowered pillow my Grandmother embroidered for me. Now it matches! The last couple nights I've been staying up super late, determined to finish this thing, hand sewing the binding, a nice fuzzy velvety purple fabric. Earth Day - Elementary School Lorax t-shirt, tie-dyed by yours truly when I was really into that. middle strip - From a bar in Aberdeen, Scotland that used to be a church and now has a haunted mansion theme. If you drank all 7 deadly sins cocktails, you won a deadly sin t-shirt. I did it in one night (oh, to be 22 again! They were actually pretty weak anyway) I, of course, choice the Gluttony tee. NHSMI - Summer high school music program at Northwestern, met some of my best friends there, convinced me to be a music major. Got vocal nodules and put on vocal rest, didn't work (I was having too much fun), got in trouble. Pirates of Penzance - How I spent my second semester of my fifth year of college. Realized I hated being in staged productions, still had a blast. Love Gilbert & Sullivan. Love this show. High School Honor Choir - Yes, I was a high school choir geek. Did this program twice. Leader of the Pack - Didn't get a part in this junior high production, based on the music of Brill Building's Ellie Greenwich. The music is AWESOME ("River Deep Mountain High", "Be My Baby", Da Doo Ron Ron". Worked as production assistant instead, building sets, etc. Wished I was in the show and was so jealous of those that were. They got to wear gogo boots! Forever Plaid - A musical about a four-part harmony vocal group in the early 60s, was a total groupie, saw the show five times, know every word. It's been on PBS lately and I still love it. 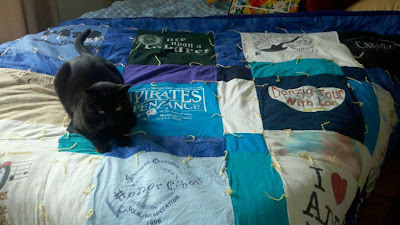 Cabaret t-shirts - There are three of them on this quilt. We wore them during the shows. Cabaret was our High School musical Revue and I learned so much music being part of it. They were so much fun (but I still hate staging). Ann Arbor Blues & Jazz Fest - I volunteered with my roommate in 2002 as my fifth year of college started. It was humid and rainy. I got to see Koko Taylor sing "Wang Dang Doodle". Lori's Diner - In San Francisco. My grandma's name is Lori. University of Michigan Women's Glee Club patch - Taken from the terrible, horrible button down long-sleeved shirts they made us buy. But I went on tour with them to Europe and had a blast. Danzig Tour - hysterical t-shirt my aunt made for our clan when we went to Danzig/Gdansk in Poland, where my grandmother was born. Ten of us kids and grandkids went with her in 2002. It was in incredible experience. I heart Ann Arbor - Well, I do. Ben & Jerry's and the Great Harvest Bread Co. - high school summer jobs. Yum yum yum. Bravo Jamers! It's really fabulous. I am totally going to try it out right now.. Mwaahahahah..
WOW. Way to take it back :) Where the eff is my Leader of the Pack tshirt?! I'm sure my mom has hung onto it all these years. Amazing quilt, dude. Seriously - I'm so impressed! Makes me want to tackle a project like that. Teach me!